One of the more interesting parts of arranging my trip has been what devices will and will not accept the US voltage (they use 110v while Australia uses 240v). I plan on taking my laptop, phone, camera, electric razor, and electric toothbrush. They (or the more precise, their respective chargers) will all accept 110v except for the toothbrush. Unfortunately finding one in Australia which will accept 110v is quite difficult, and I don’t really like the ones which take AA batteries as they seem to run out of useful power pretty quickly. Taking a heavy and expensive transformer is not feasible either, and I’m not keen on buying a toothbrush over there which will have the same problem when I bring it back to Australia. It turns out that Braun do make US chargers for their toothbrushes but don’t usually sell them outside the US (given how small the charger is, I doubt it has room for a multi-voltage power supply). I was able to find one on eBay, however as it is located in the US, it would probably reach my PO Box after leave Australia. Thankfully the nice people at the Quality Inn Petaluma were willing to accept and hold the parcel for me. 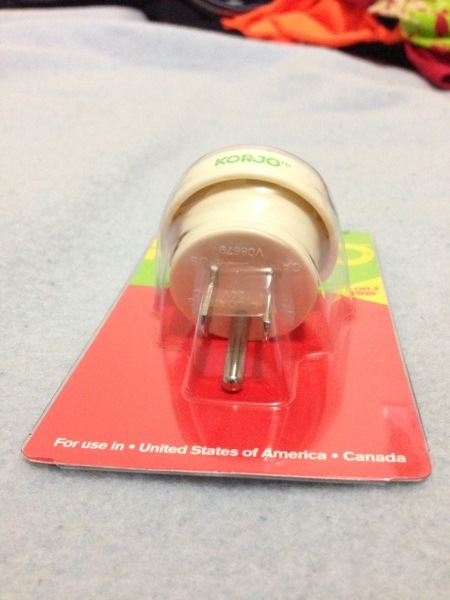 The other consideration is the plug style. 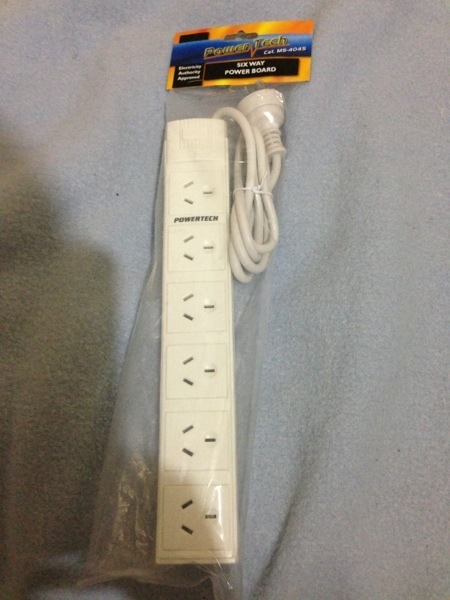 Even if an Australian appliance can take 110v, it still requires a US style plug. 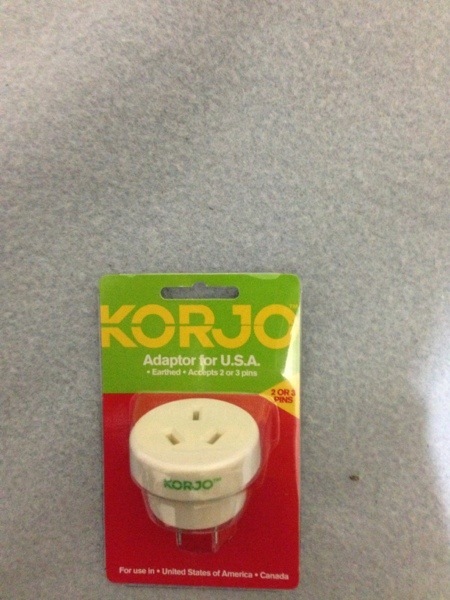 Adaptors for this are common and cheap. I’m taking two adaptors with me. This isn’t enough for all of my appliances, but I have a reason for that. One will go in the bathroom for my razor (which requires mains power to operate…it is not a chargeable one) and another for the main room. I’m only taking one for the main room as I can’t guarantee that there will be more than one powerpoint in all hotel rooms, and why take half a dozen adaptors when I can take one of these? Plug the adaptor in to the wall socket. Plug the powerboard in to the adaptor, and plug my Aussie appliances in to the Aussie-style slots on the powerboard. I went for a cheap and basic powerboard because it won’t have any problems with a foreign voltage as long as it is not being used to draw a large amount of power. A powerboard with surge protection or other fancy circuitry (such as on/off functions controlled by remote control, as I saw with one powerboard) could have problems with a foreign voltage, whereas a cheap and simple one shouldn’t have any issues. So, with that done, I am almost completely ready to go with a bit over a week until I depart. I nearly fell off my chair the other night when I heard a radio PSA from the US Government’s Environmental Protection Agency (the massive bureaucratic nightmare that it is) which spent 30 seconds advising listeners that vacuuming the floor of your house is a good idea. Good heavens Uncle Sam’s overbearing cousin…really? I would never have guessed. But then, when I thought it couldn’t get stranger, Jim Ball brought my attention to this bizarre idea from the gigantic unelected government known as the bureaucrats who seem to wield most of the power in the European Union. They’ve decided to take decisive action on that most pressing issue: overpowered vacuum cleaners. Under European Commission ‘eco’ rules that will come into force next September, the power of new vacuum cleaners must not exceed 1,600 watts. That figure will be lowered further to 900 watts by 2017. Current cleaners boast an average of 1,800 watts. The move angered manufacturers, who say it will do nothing to make cleaners more environmentally friendly and will simply reduce efficiency in the home. Critics say cleaners satisfying the new rule may use less power, but householders will have to use them for longer so they are likely to use the same amount of electricity in the long run. So people will either spend double the amount of time cleaning, reducing productivity, or they’ll live in dirtier homes. Maybe the EU will be able to put together a European version of the EPA’s radio spot…at least people will have something to listen to while they spend those extra hours cleaning then. A truck has been driven in to a major Sydney tunnel with the tipper trailer up, causing damage to the roof of the tunnel, an electronic sign, and most importantly breaking some fire sprinklers and flooding the tunnel. This is causing major delays, not least of all to people trying to get to the airport. Sadly it seems that major delays on Sydney’s roads whenever something silly happens anywhere is a very regular occurrence, and the airport is often one of the worst affected places, which is really silly considering how time-sensitive and economically important that airport is. The numpty in the tipper truck is one of the main reasons why, when I fly out of the country from Sydney airport next month, I’m paying the extra amount to fly from Canberra to Sydney rather than driving up or getting a bus to Sydney. The Sydney road network grinding to a halt whenever one person does something silly is costing Sydney’s economy a fortune because tourists from outside Sydney will do anything to avoid those roads. Dodgy goings-ons in unions…is anyone surprised? Yesterday’s revelations about some of the things which go on in unions (the CFMEU is named, but other unions have their problems too) came as no surprise to me or, I would think, many Australians. A FORMER senior union official in Queensland has pledged to provide Attorney-General George Brandis’s planned royal commission into unions with evidence of alleged corruption, dodgy elections and unlawful industrial actions in the state’s mines and energy sector. The claims came from Stuart Vaccaneo who used to be the CFMEU’s senior vice-president. At the same time, there were also claims of similar activities within the CFMEU in New South Wales involving corruption and the Barangaroo construction project in Sydney. Sadly, but not surprisingly, death threats have been made against certain people who have tried to expose the grubbiness within the CFMEU. A building union stalwart says he received death threats after he tried to stop his union’s dealings with a Sydney crime figure. Tony Abbott has taken aim at Labor for abolishing the Australian Building and Construction Commission, and quite rightly so. The ABCC was very effective at stamping out this sort of behaviour and ensuring people were prosecuted for breaking the law. Not that you’d be able to draw the link clearly enough for a legal case for “proceeds of crime”, but it’s fair to say that Labor benefited from this illegal activity by way of the revenue they receive from the union movement, and how much extra revenue the unions were able to rake in through dodgy means after the ABCC was abolished. The sooner Tony Abbott can restore the ABCC, the better. Is it any wonder that I refuse to let my superannuation be managed by one of those union-owned funds. Apart from the fact that the non-union funds tend to perform better (the union-run funds claim they perform better, but they use very carefully manipulated data to make that false assertion), I just don’t want any of my fees going towards the unions. The unions already openly push for and fund socialism and the Labor Party…that’s bad enough without them helping organised crime groups along the way. I won’t help them do it. My attention has been drawn to the fact that the comment moderation system on this blog is currently not functioning correctly. I was made aware of this by a handful of comments slipping through in recent days which should have required my intervention and approval before appearing (some of those have since been removed as I would not have let them through). Unfortunately the obvious solutions to this problem have not fixed it, so as an interim measure until I have a bit more time to find and fix the problem, I have turned on the function which requires all comments to go through the moderation process. I apologise for the inconvenience this causes. Hopefully it will be fixed within the next few days. Friday Funnies: Which file extension are you? It’s rare that I find an online personality quiz which is remotely accurate, and it’s even rarer that I come across one which is amusing. This morning I came across this one which fits both bills. A decent bit of geek humour which isn’t (for most file extensions) out of the understanding of non-programmer types. Some of the questions are quite amusing too. I’m not 100% sure about the “improving” bit (I never really think I’ve improved until the proof whacks me across the head) but the rest is accurate. I like a certain amount of routine but I adapt when I have to, but I can get more than a bit frustrated when dealing with people who don’t know what they’re doing…especially if they should know what they’re doing. I was hoping to be a .inf file which apparently is informative and without which life can be difficult for whoever is left. Alas this is one of my delusions…I may be informative, but everyone’s life carries on quite well without my input, even if I think my input is indispensable at times. When I selected a few people recently who I would support if they chose to run for the presidency of the United States, I deliberately did not select radio and Fox News host Sean Hannity as I didn’t think there was any serious chance of him running, especially not in 2016. While I still think he won’t run in 2016, it does look like his interest in running for public office is increasing in the wake of his decision to (eventually) leave New York state after Governor Andrew Cuomo declared that “ultra-conservatives” are not welcome in the state. A source who was on Hannity’s Fox News show last fall told The Hill the conservative commentator mentioned the possibility — off camera — of running in Florida. On his radio show, Hannity said he “can’t wait” to leave New York in the wake of Gov. Andrew Cuomo’s (D) remarks that extreme conservatives have “no place” in the Empire State. Hannity, a native New Yorker, has repeatedly ripped the state’s tax rates. He said he would move to Texas or Florida, which don’t have state income taxes. During an appearance on Greta Van Susteren’s “On the Record” Fox show Tuesday night, Hannity said his departure isn’t imminent. Hannity noted his son is still in high school, and he has more than 100 staffers who work on his television and radio shows, suggesting it would be irresponsible to immediately move his media operation elsewhere. Sean Hannity is an interesting creature in conservative circles in that he is one of the few genuinely conservative people who is both unafraid of standing by his convictions and has good friends in the more moderate “establishment wing” of the Republican Party. As such, Hannity could be one of the few people who could unify the GOP behind a truly conservative platform. I have been critical of Sean in the past for giving some of his moderate Republican guests (especially regular guests like Karl Rove) a bit too much room to explain their point of view without challenging it, which isn’t to say that he doesn’t eventually challenge it, but I have thought he has sometimes left a few too many points unaddressed, however I have noticed that he has been much more strident in his promotion of conservative principles and solutions ever since his radio contract negotiations were finalised and he gave his Cumulus Radio affiliates the heave-ho in favour of Clear Channel affiliates. I put this down to not having to expend energy on contract negotiations, and not having to deal with pressure from Cumulus to be a bit more moderate in his views. I think Sean would do a good job as US President and would be especially effective at “rallying the troops” in the House and Senate to support his conservative agenda. His lack of governing experience could be made up for with a good Vice President and also by his business experience. I’m not convinced that Sean would greatly enjoy the job, but I think he would be very effective. That said, he has made no mention of a run for President and seems instead to be giving consideration to some other public office such as a congressional seat. I think Sean’s talents would be wasted in Congress or in a state government (although after two terms as President I would love to see him become a state Governor…but after, not before) as his ability to influence public policy from the media on a national scale is of much greater importance and value to the nation than his ability to be a conservative vote in the House or Senate, or to reform a state. If he is to run for office, then I think his talents dictate that the most suitable office is the top job. But as much as I would like to see it, I doubt it will happen, and certainly not before 2024. He will be 63-years-old in 2024 so it’s not out of the question, but I rate the chances of it happening as being quite low. I’m not entirely against the idea, but while the federal government is dealing with continuous budget deficits it is a bad time to start handing out vouchers for marriage counselling. Based on current averages, the program’s 100,000 vouchers would be handed out to newlyweds within a year. While Kevin Andrews is right that having children grow up with their biological parents in a loving household where the marriage of those parents is a strong and loving bond is by far the best option, I see two issues with the planned trial. 1. Newlyweds are the wrong target. If the vouchers are going to be handed out, they should be given to couples who are actually having problems, not couples who may or may not one day run in to problems. 2. The federal government currently spends more than it takes in. This is mostly due to the profligate spending of the Kevin Rudd and Julia Gillard governments, however Tony Abbott’s government has not yet shown much initiative in reigning in the budget. An argument could be made that this program might lead to reduced federal benefits for single parents being paid to divorced parents at a future date, but it seems unlikely that this would save the federal budget much money, and the initial and ongoing expense of the program makes it the type of high cost to potentially minimal yield program which should be trialled when the budget is in a much stronger position. Ultimately I’m not sure that the government really needs to be involved in this area at all, but if it insists on being involved, then this program should surely be of a much lower priority for implementation than reducing immediate spending and paying off the federal government’s debt. As my US trip gets closer and I’m trying to plan some more of the finer details of the trip, the weather forecast is of some interest to me as I may need to plan around snow, ice, or other inclement weather. As such, AccuWeather‘s 45 day forecast is of some interest to me. As it is such a long-range forecast, I don’t expect it to be perfect, but if it can be somewhat accurate with general weather trends then it could be a useful planning tool. I’ve been keeping an eye on it for a while and haven’t seen any huge movements in the forecasts so I’m willing to give it some credence. To that end, each week (probably on Mondays as of next week) I plan to post the current forecast, both to see how it changes over time, and compare it to the actual conditions on the day. For my convenience, I will be posting the forecasts using Celsius temperatures. February 11. Los Angeles, San Francisco. (I will be flying in to L.A. and then flying on to San Francisco). It looks like there might be a bit of light rain, but nothing to worry about. After arriving in San Francisco I’ll be driving to Petaluma and staying there for a few days. It looks like some good weather. On the 14th I depart Petaluma and drive to Las Vegas. I should pass through or near these places. The weather looks OK.
On the 21st I fly from Vegas to Kansas City via Phoenix. The forecast for that is all good. My time in Kansas City looks good too. Positively balmy in fact. But when I drive to Fort Dodge, look how quickly the temperature drops. Fort Dodge looks like it might be a little wet, but still OK. The drive to South Bend is looking like a slow one. It’s already likely to take all day, but might take a little longer than I expected. My other main route option bypasses Cedar Rapids and takes me near Rockford, but the forecast is roughly the same. No matter the route, I have to go through or near Gary. South Bend is looking as cold as I would expect, but without the snow I was hoping to see. On one of the weekdays I plan on going to Hillsdale. I see a chance of snow on the Thursday. The drive to the Washington D.C. area looks very hospitable. AccuWeather’s 45 day forecast does not yet stretch all the way through my Washington D.C. area visit, but the bit it can see looks nice. So far it looks like the weather will be nice to me and not be as cold as I had expected, but I have to admit the trip from Fort Dodge to South Bend has me a tad concerned, but if the early-morning ice is minimal then it should be fine. Andrew Bolt has posted some exciting news on his blog. The Bolt Report returns to Channel Ten on the 2nd of February and has been expanded from half an hour to a full hour. Andrew hinted at this at the end of last year, but it’s nice to have confirmation. He has also dropped a hint about a new segment on his show. The segment will “balance something on the ABC” which sounds to me as if he is taking his “Media Watch” segment from his Monday evening radio appearance and putting something similar to it on his TV show. Perhaps he can get Gerard Henderson to be a contributor to this new segment. I’m pleased to see Andrew returning in February. His show is great, and I’ll get to see two episodes before I head off overseas. Hopefully the videos of it on the News Limited website are locked down to just Australia as, if I get time, I would like to watch the show while I’m overseas.